Nathan Parker 2 days, 8 hours ago. 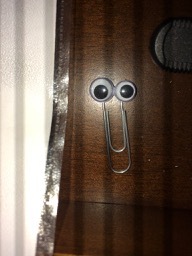 One of the famous (or infamous) features of Microsoft Office from Office 97-2003 was Clippy, the little animated paperclip that appeared asking if you needed assistance while working in Microsoft Office. Most users found Clippy annoying, although I personally always enjoyed having fun with Clippy, right-clicking on him and clicking on animate when I needed a little brightening up on a difficult Word document. Back on April 1, 2014, Microsoft’s TechNet UK blog announced Microsoft SmartClippy, Microsoft’s latest innovation to take Clippy to the next level (look at the date). I happened to reach out to the fine folks at Microsoft’s TechNet UK blog and ask for a review copy of Microsoft SmartClippy awhile back, and now that I’m a member of the AskWoody community and it is the month of April, I thought I’d post a review of my hands-on with Microsoft SmartClippy. First of all, the reason I asked Microsoft for a review copy of Microsoft SmartClippy is while SmartClippy looked simple enough for DIY’ers to make their own, I was always worried about a DIY SmartClippy giving me an error message in the future that I wasn’t using a “genuine” Microsoft SmartClippy. Since I’m all for using genuine copies of Microsoft products and stamping out piracy, I requested a “genuine” Microsoft SmartClippy from the fine folks over on the TechNet UK blog. Since I’m in the US, I had the Microsoft TechNet UK blog send my copy of Microsoft SmartClippy to my friend and fellow weather blogger in the UK, Harry Hayfield, who then relayed the shipment to me. Since my Microsoft SmartClippy had to hop across the pond in transit, unfortunately, he arrived with his eyes disconnected from the rest of him. Thankfully I am an expert in the ELMER programming language, so I wrote a macro through its GLUE interface to get Microsoft SmartClippy’s eyes re-attached to him and ready to go. My experiences with Microsoft SmartClippy have been quite positive so far. Microsoft SmartClippy makes it easy to attach new innovation to my life. Microsoft SmartClippy keeps all of my physical documents organized for those times I have to turn to storing information on dead trees. If I need to clip information to my shirt pocket, Microsoft SmartClippy is right there to assist. Microsoft SmartClippy uses the same cheerful smile and willingness to assist that was available in Microsoft Office, with more practicality for real-world applications. Microsoft SmartClippy is fully compatible with Windows PC’s, Macs, mobile devices, and Microsoft SmartClippy seems to even enjoy spending time around Linux. 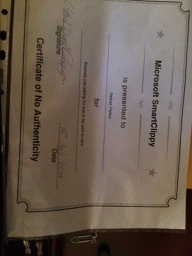 Every “genuine” Microsoft SmartClippy also comes with a signed copy of Microsoft’s Certificate of No Authenticity, an important record to keep on file to ensure to others you’re running a “genuine” copy of Microsoft SmartClippy and not a DIY knockoff. My copy of Microsoft SmartClippy is the standard edition of Microsoft SmartClippy (which I believe goes by Microsoft SmartClippy Pro). At the time of the announcement, an Enterprise version of Microsoft SmartClippy is also available for tougher tasks, as well as different sizes and colors. I that Microsoft is also considering new versions of Microsoft SmartClippy, including Microsoft SmartClippy ProPlus for enterprise distribution, Microsoft SmartClippy Home and Student for home and educational use, Microsoft SmartClippy Home and Business for home or office use, and a new version of Microsoft SmartClippy called Microsoft SmartClippy 365 that allows for automatic updates to Microsoft SmartClippy as they become available (in a range of variants, including: Home, Personal, Business Essentials, Business, and Business Premium). Microsoft SmartClippy 365 will be based on a new technology called “Clip-To-Run” to make it even faster and easier to get started with Microsoft SmartClippy. In other words: SmartClippy does… what? It was an April Fool’s joke from Microsoft, but I really did ask the TechNet UK blog to send me one to “review” for fun. I also recently purchased another adorable product for Mac enthusiasts I’ll be reviewing on here maybe next week. That said, what a good way to spend it. PS my lawn could do with a trim, whenever you get bored with Clippy. Someone has way too much time on their hands. That said, what a good way to spend it. PS my lawn could do with a trim, whenever you get bored with Clippy. Hee hee! I’m generally insanely busy, but I did promise Microsoft I’d write a review on Microsoft SmartClippy when I received him, then the tech blog I contributed to phased out, plus I had to ensure a few additional transitions with work, school, technology use, etc., I didn’t find a good place to post a review. Now that I’m on AskWoody and the site is hanging around, I finally had an avenue to post my review! So, SmartClippy was meant as an April 1st joke! But, because of Nathan’s timing, it showed up here more like an April 15th joke. One of the very best April 15th jokes — compared to most of them, that is. Because April 15th jokes are not really very funny. Here is a real life example: I just have finished filling out and printing the 2018 tax forms with the Mac ahead of tomorrow’s annual deadline (April 15th is Tax Day, here in the USA – got to make that clear up front, so Kirsty does not remind me this is an international site), after dealing with a mysteriously uncooperative, but creative, printer (or printer application) that decided to enliven my evening by shading random file entries in purple. But I tried again, and again, and, in the end, prevailed: nary a tiny bit of purple to be seen anywhere. Tomorrow, I’ll mail the lot. Now, I’m going to bed. Mission accomplished. I also print and mail in the forms. I’d love to do everything online, but the IRS website is so confusing about eFiling and some of the third-party services they use, I’d rather trust my info going through the mail than going through who knows who with some of the third-party websites they use. Nathan: for your IRS taxes next year (filing in 2020) check this site out. I’ve used them since 2007. Just follow the simple wizard and built in are ‘safe checks’ for you information and etc. Shouldn’t this be moved to Fun Stuff? Absolutely. I’m still digging into the structure of AskWoody threads. I posted this here since it’s the closest to a “Microsoft Office” product that I know of. 🙂 Fun Stuff would be a better place for it, and where I’ll post my review on the adorable Mac product I have to mention next.